The property was well maintained, and clean at all times. Very high quality. Loved the beautiful beach access from the hotel. Dukes restaurant was great for any meal. The view was fantastic! The pool and beach are great! This is my third stay at Honua Kai. The condos are imaculate and have fully loaded kitchens with laundry. Great for travel with family. Direct beach acess, wonderful 24 hour fitness center. I would suggest an earlier check in time. Traveling with children it is hard to check in past 2 pm (4 pm is WAY to late). Also check out is a little early for a check in at 4 pm. Checking out at 11 am. I suggest they move check in to at least 2 pm and check out to 12.
service was excellent, hotel is very new and clean. Pros: Spacious rooms, quick room/housekeeping service. Excellent pools for kids and adults. Valet was included in the resort fee. Clean and well kept property. Cons: No resort entertainment, no activities (except orientation which starts at 8 am), no bars at the pool or in the lobby. Pool service was not up to par for an equivalent 4 star resort. I felt like the only way to get noticed was to be part of a large group. Beach is ok, kinda rocky right in front of the property. I would say for a resort that charges approx $300 and up per night, this was an average experience. We really liked the room service folks, lobby and concierge staff. Very enjoined to stay in this property for the family vacation. Right on the beach, easy access to the Beach Walk. Several pools to choose from if you don't enjoy the beach. The property is very well maintained inside and out. Staff is friendly and helpful. I feel like the Resort Fee is a bit high - I would almost rather the cost per night be slightly higher than to be charged a per night resort fee, for some reason those annoy me. The room was spacious, and I love having a kitchen. So much easier to make our own coffee in the room and enjoy the view each morning without having to walk down to the coffee shop. Also nice to keep snacks and water in our room in the fridge. Very nice hotel. Room was clean and very comfortable. Staff was friendly. Had an issue with the TV that they never got fully resolved. Not a major issue as didn't spend much time watching TV anyway. Full access to the beach, but the beach is narrow. Best waves were in area of rocks so boogie board use was limited. Whale watching and zip lines in the area were awesome. Overall would recommend. Upon arrival, and the entire time at this resort, the staff were very friendly and eager to please. Additionally, this resort is absolutely beautiful! The rooms are very nice, the pools are amazing and I love the beach access! I also love how quiet and peaceful the resort was. I would definitely come back! I wish our building had its own fitness center, with less cardio equipment( it's Hawaii, enjoy outside! ), but definitely needed a little bigger space with a full set of free weights. Temperature in room was a little stifling. The pool are a little small with all the kids that were there, need more of an adult only area. Great big comfortable rooms. Beautiful sliding windows with ocean view and sliding screen to keep mosquitos out. Staff was friendly and always avaible. Cons: Towel service can be a hassle. Each time you must provide a towel card in order get towels and you must return all towels each time if not you'll be charged a fee. It's difficult to keep trsck of towels when you're in and out the pools. We had the chance to stay there for 10 days and the experience was fantastic , the hotel is very clean and they clean our room every other day, the appliances were in very good standing , all rooms are very spacious and accommodate with a very large balcony. The beach is right in front and the restaurant( Duke) was good. Michael. Grounds were well cared for; it was nice having an adult pool. Staff was friendly and helpful. Having Dukes on the property added to our great experience. Being able to walk to one of the best beaches in Maui was fantastic. The grocery store across the street was handy as well. The only room for improvement would be not having all the wash cloths removed by the cleaning staff; by the third day we had none and they were never replaced. The dryer didn't work properly, we had to re-start it every two minutes at least 5 times; to be fair we never called maintenance. Other than those few minor things our stay was excellent. We had a two room/two bathroom suite which was extremely comfortable and homely; modern decor, well kept, laundry detergent, dish soap, and bathroom amenities were provided. Mahalo. 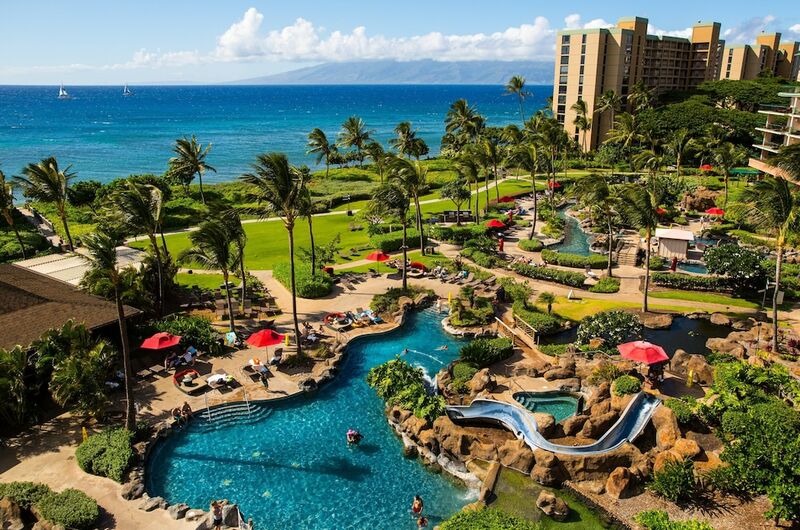 Honua Kai Resort & Spa places you within 2 miles (3 km) of popular sights like Kaanapali Beach and Black Rock. This 285-room, 4-star condo resort has 4 outdoor pools along with a full-service spa and a restaurant. Sit down for a leisurely bite to eat at the onsite family restaurant, or enjoy a drink at the bar/lounge. You can get a quick energy boost at the coffee shop/café. For your convenience, a full breakfast is served for a fee on weekdays from 7:30 AM to 11:00 AM and on weekends from 7:30 AM to noon. Each condo is air-conditioned and features a kitchen and a furnished lanai. There's space to spread out with a separate bedroom, a dining area, and a sitting area. A flat-screen TV comes with cable channels and a DVD player, and guests can stay connected with free WiFi and wired Internet. Beds sport premium bedding and the bathroom offers a hair dryer and free toiletries. Other standard amenities include a washer/dryer, a coffee maker, and free long-distance calls. Limited housekeeping is available. Guests of Honua Kai Resort & Spa have access to a full-service spa, 4 outdoor pools, and a children's pool. If you decide to drive, there's free valet parking. The front desk is staffed 24 hours a day to help with tours/tickets and dry cleaning/laundry. Other amenities at this beach condominium resort include a fitness center, free WiFi in public areas, and express check-in. Full breakfast is served on weekdays from 7:30 AM to 11:00 AM and on weekends from 7:30 AM to noon for a fee. Dukes - Restaurant and bar serving breakfast, lunch, and dinner. Aina Gourmet Market - Café serving breakfast, lunch, and dinner. The condo resort has 4 outdoor swimming pools and a children's pool. Other recreation options include a fitness center. Nearby construction will be ongoing Monday - Friday (9 AM-5 PM) until the end of 2020. During that time, construction sites may be visible from guestrooms. For more details, please contact the property using the information on the reservation confirmation received after booking.